MFA Photo/Video faculty member and celebrated filmmaker Laura Parnes is screening her newest work Tour Without End at several theaters and festivals this spring. Tour Without End will be on view at the Wexner Center for the Arts at Ohio University (with Parnes in attendance) this March 21. The film will also show at Strange Truth 2019, a showcase organized by Haverford College's Bryn Mawr Film Institute, on April 3. The newest film by convention-busting Parnes features an all-star parade of downtown legends (from Gary Indiana to Kathleen Hanna) as it follows a fictional rock band, Munchausen, navigating New York’s alternative music scene in the midst of rapid gentrification. Shot over the course of four years, the film culminates when the band stops in Cleveland during the 2016 Republican National Convention and the gap between fiction and history gets even smaller and more chaotic. 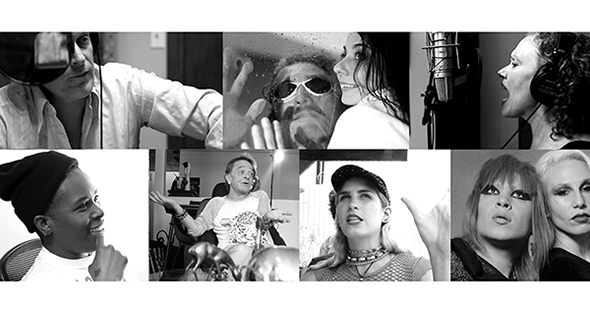 The film features such underground legends as Eileen Myles, K8 Hardy, Brontez Purnell, Kate Valk, and members of MGMT, Gang Gang Dance, Le Tigre, and Eartheater. In addition to the success of Tour Without End, Parnes is also celebrating a recent Yaddo residency award. Past recipients have included luminaries such as James Baldwin, Truman Capote, John Cheever, Patricia Highsmith, Langston Hughes, Flannery O’Connor, William Carlos Williams, Noah Baumbach, Lisa Cholodenko, Tamara Jenkins, John Kelly, Elizabeth Thompson, Matthew Weiner, and Jessica Yu. Laura Parnes’ is a multi-platform, lens-based artist, crafting darkly comedic narratives of trauma and repressed memory around mass-culture experiences and youthful rites of passage. Using historical, literary and popular culture based references, she addresses issues related to cultural production and societal malaise. She has screened and exhibited her work widely in the US and internationally, including: The Wexner Center for the Arts, Columbus, Ohio; The Institute of Contemporary Art University of Pennsylvania, Philadelphia, PA; The International Film Festival Rotterdam, Rotterdam, Netherlands; Deste Foundation for Contemporary Art, Athens, Greece., LOOP Festival, Barcelona, Spain; and Light Industry, Brooklyn, NY--among many others. The Kitchen, is proud to present a screening of Laura Parnes’ multiplatform project/film, Tour Without End (Twenty-One Portraits and a Protest). Directed and produced by Laura Parnes, and written in collaboration with the film’s participants, Tour Without End casts real-life musicians and artists as fictional bands on tour that evolves into a cross generational commentary on culture, identity and politics in the Trump era. The work revels in the sometimes hilarious— but always complex —band dynamics the characters endure in touring, collaborating, and aging in a youth-driven music industry. As the players move in and out of fictionalized characters and real life, the film moves in and out of non-linear narrative and historical document. Top: pictured from left to right; Jim Fletcher, Matthew Asti, Lizzi Bougatsos, Kate Valk. Bottom: Shannon Funchess, Gary Indiana, Alexandra Drewchin, Neon Music, and Alessandra Genovese. The piece will be shown on June 11 at 8pm with live musicians including BB TAY VEE, Macy Rodman, and JD Samson with Michael O'Neill, Roddy Bottum, Caitlin Frame and Lee Free will accompany this screening. Shot in real environments and situations over the course of 4 years between 2014-2018, at over 15 DIY music spaces in and around NYC, Tour Without End functions as a time capsule made more apparent by the shuttering of many of the film’s locations due to NYC’s rapid gentrification. The film’s multitude of characters are legendary performers in the downtown NYC arts scene including Wooster Group founder Kate Valk, Jim Fletcher (The NYC Players), musicians Lizzi Bougatsos, (Gang Gang Dance), Kathleen Hanna (The Julie Ruin), Brontez Purnell (The Younger Lovers), Eileen Myles, Alexandra Drewchin (Eartheater), Nicole Eisenman, K8 Hardy, Johanna Fateman (Le Tigre) Shannon Funchess (Light Asylum), JD Samson (MEN), Gary Indiana, Kembra Pfahler, (Voluptuous Horror of Karen Black), Rachel Mason, Tom McGrath, Matthew Asti (MGMT), Becca Blackwell, Christen Clifford, Alessandra Genovese (Crush), Rogelio Ramos (Love Pig), Kenya Robinson (Cheeky LaShae) and Neon Music (Youth Quake). Faculty member and artist, Laura Parnes’ critically acclaimed films and installations address counter-cultural and youth-culture references where the music is integral to the work. For over twenty years these large-scale cinematic installations have engaged numerous notable individuals in her complex and ambitious collaborations. She has screened and exhibited her work widely in the US and internationally, including: Whitney Museum of American Art, NY; MoMA PS1, NY; Miami Museum of Contemporary Art, FL; Brooklyn Museum; Deste Foundation for Contemporary Art, Athens; The International Film Festival Rotterdam, Rotterdam, Netherlands; and Museo Nacional Centro De Arte Reina Sofia, Madrid; and NY and on PBS and Spanish Television. She recently had solo exhibitions at LA><, data-preserve-html-node="true" LA, Participant Inc., Fitzroy Gallery, and solo screenings at the Museum of Modern Art and The Kitchen, New York City. Parnes is a 2013 John Simon Guggenheim Memorial Fellow, a 2014 NYFA recipient, and a 2016 Creative Capital Awardee. Video Data Bank published a box set of her work, and Participant Press published a book of her scripts titled ‘Blood and Guts in Hollywood: Two Screenplays’ by Laura Parnes with an introduction by Chris Kraus. She has also directed music videos for The Julie Ruin and Le Tigre. Filmed in October 2008 on the eve of Obama’s historic election and an unprecedented economic crisis, One October by alum Rachel Shuman acts as a lyrical portrait of New York City as it follows WFMU radio reporter Clay Pigeon as he takes to the streets to talk to fellow New Yorkers about their lives, their dreams, and their relationship with the city. These revealing interviews are woven between vivid scenes of New York’s eccentric byways, which together reveal a city—and a nation—at a crossroads. The film first premiered at the Full Frame Documentary Film Festival. Clay Pigeon interviews Stacie who is worried about the changes in Harlem. ONE OCTOBER will have a weeklong theatrical run at the Maysles Documentary Center in Harlem, May 11–17, as part of their 10-year anniversary celebration. Following the screenings, there will be Q&As, panels, and special presentations with myself and various characters and filmmakers involved in both productions. For more details and to purchase tickets, please click here. A wide shot of the vacant lot where Stacie is standing in Harlem in October 2008. Rachel Shuman (director, editor, producer) is a documentary filmmaker and editor who has worked in New York City for twenty years. Her directorial debut, Negotiations. premiered at the 2005 Tribeca Film Festival. She Directed Art, Architecture, and Innovation: Celebrating the Guggenheim Museum, which aired on PBS and is now on view at the museum. Her editing credits include various independent documentaries and nonfiction television, and she is proud to be a board member of the Karen Schmeer Film Editing Fellowship. Originally from Boston, Rachel received a BFA from the California College of the Arts in San Francisco and an MFA from the School of Visual Arts in New York in 2004. That same corner lot is now home to the new Whole Foods in Harlem. Outside In is a 2017 American drama film, directed by Lynn Shelton (1995 MFA Photo, Video and Related Media graduate), from a screenplay by Shelton and Jay Duplass. It stars Jay Duplass, Edie Falco, Kaitlyn Dever, and Ben Schwartz. The film had its world premiere at the 2017 Toronto International Film Festival and is scheduled to be released ins select theaters on March 30, 2018, by The Orchard. Outside In tells the story of an ex-con adjusting to modern life forms an intense bond with his former teacher, who herself is struggling to connect with her daughter. In colloboration with the SVA Filmmaker's Dialogue, SVA will hosting a screening and q-&-a with Lynn Shelton on Tuesday March 27th at 6:15pm. The event is free for students with an SVA ID. For more information, please click here. Alumni Amy Jenkins upcoming film, Instructions on Parting (2018), will make it's world debut at MOMA on Febuary 16th, 2018. “Instructions on Parting” weaves breathtaking artistic footage with cinema verite to tell an elegiac story about transformation, grief, and the essential nature of the collective human journey. Using personal home videos, Jenkins presents an intimate portrait of the cyclical nature of life and death. As she navigates the emotional transition into motherhood, she must also make sense of the untimely passing of several members from her immediate family. For more details and to purchase your tickets for the screening please click here. Amy Jenkins’ approach to art-making is multidisciplinary; the installations she creates combine video, sculpture, performance, writing and audio to create immersive environments. Crossing the static bounds of space and object, her projected video creates a poetic space that emulates thought and memory. The video in three-dimension becomes malleable, altering the boundaries of the physical and illusory. Over the years she has worked with the moving image combined with sculpture in a number of ways, both with miniature objects and with large architectural elements. Consistent in all of her installations is the focus on a sense of place and the psychological aspects of interiors, whether physical in structure or of an individual's psyche. Performance, her own and her family’s, is also an important reoccurrence in Jenkins’ work. Jenkins’ content can be challenging and revealing; familial relationships, home, sexuality, and the male/female identity are themes she frequents. Visceral and emotional, these personal narratives offer a window into intimate life, where the commonplace becomes surprising and unexpected. Filmed in October 2008 on the eve of Obama’s historic election and an unprecedented economic crisis, this lyrical portrait of New York City follows WFMU radio reporter Clay Pigeon as he takes to the streets to talk to fellow New Yorkers about their lives, their dreams, and their relationship with the city. These revealing interviews are woven between vivid scenes of New York’s eccentric byways, which together reveal a city—and a nation—at a crossroads. This screening of the film at the Rubin Museum on Wednesday November 8th, 2017 at 7pm will be accompanied by a live score, composed by Paul Brill, and followed by a talk back with Brill, director Rachel Shuman and radio reporter Clay Pigeon. Additionally, the film will be screening Saturday Nov. 11th at 2017 Fairhope Film Festival for those in the Alabama area. Image courtesy of Rachel Shuman. Nothing Without Us is the first documentary to tell the story of how HIV+ women on two continents turned a devastating diagnosis into a fight for survival — and a movement to end a global epidemic. Since the early 90s, AIDS has largely been painted as affecting mainly white, gay males. Rich with stories, facts, and moments of hope, “Nothing Without Us” brings light to those who this narrative passes over. The film was directed by Harriet Hirshorn and edited by our very own Mary Patierno, who jointly produced the piece. Rachel Shuman's new film ONE OCTOBER (56 min.) will premiere in NYC on May 17 @7PM as part of Stranger Than Fiction at the IFC Theater.